Source: South America, New Zealand and the United States. Handling Tips: 45°F, keep cool and dry. General Information: A member of the Physalis genus of plants. Many Physalis species are called groundcherries. Physalis peruviana (physalis = bladder) is the plant and its fruit, also known as Cape gooseberry. Physalis peruviana is closely related to the tomatillo, also a member of the genus Physalis. As a member of the plant family Solanaceae, it is more distantly related to a large number of edible plants, including tomato, eggplant, potato and other members of the nightshades. Despite its name, it is not closely related to any of the cherry, Ribes gooseberry, Indian gooseberry, or Chinese gooseberry. The fruit is a smooth berry, resembling a miniature, spherical, yellow tomato. Removed from its bladder-like calyx, it is about the size of a marble, about 1–2 cm in diameter. Like a tomato, it contains numerous small seeds. Applications: It is bright yellow to orange in color, and it is sweet when ripe, with a characteristic, mildly tart flavor, making it ideal for snacks, pies, or jams. It is relished in salads and fruit salads, sometimes combined with avocado. Also, because of the fruits decorative appearance, it is popular in restaurants as an exotic garnish for desserts. History: Native to high-altitude, tropical Peru, Colombia, and Ecuador, where the fruits grow wild, physalis is casually eaten and occasionally sold in markets. Only recently has the plant become an important crop; it has been widely introduced into cultivation in other tropical, subtropical and even temperate areas. Cross sectionThe plant was grown by early settlers of the Cape of Good Hope before 1807. 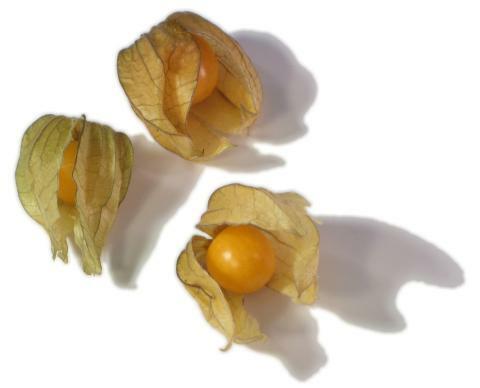 It is not clear whether it was grown there before its introduction to England, but sources since the mid-19th century attribute the common name, Cape gooseberry to this fact. A popular suggestion is that the name properly refers to the calyx surrounding the fruit like a cape. This seems however, to be an example of folk etymology or false etymology, because it does not appear in publications earlier than the mid 20th century. Not long after its introduction to South Africa, Physalis peruviana was introduced into Australia, New Zealand, and various Pacific islands.